The next generation of processors from AMD is knocking on the door. We did see a glimpse of the 7nm giants AMD has to offer at CES 2019. Apart from the desktop processors, there is another thing which everyone is waiting for. That is, the processor which will power next-generation consoles. Previously, both Sony and Microsoft used AMD APUs in their consoles. And as expected, the same trend will follow in next-generation consoles as well. Today, Twitter user Tum_Apisak found some notable information about the upcoming APUs AMD has to offer for consoles. As IXBT reports, “The TUM_APISAK insider found in some database information about the AMD hybrid processor, which he believes will be used in one of the upcoming consoles”. First of all we have the name of the APU. The APU is named “Gonzalo” as per the leak. The rest of the information comes via breaking down the codename of the APU. Breaking down the codename as seen in the image, we get to know a number of stuff. The APU will be an eight-core processor with a frequency of 1.6-3.2 GHz. 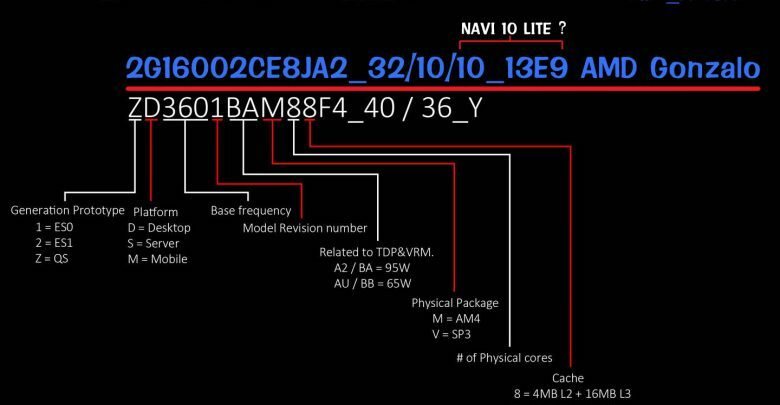 Furthermore, we learn that the APU will be powered by Navi architecture, or Navi 10 lite to be precise, as per the source. There isn’t much that can be concluded from the above leak, but it still gives us some information about what AMD has in store. The APU most likely already exists in silicon and is through tests according to IXBT. We recently came to know that Sony will be skipping E3 2019. That just adds up to the already firm fact that the PS5 is in development, and will be revealed pretty soon. Whether that’ll be sooner than we expect is something time will tell.